Topic for reporting any Nop HTML Widgets problems. I'm finding an issue with the multi-store functionality with a new widget I created. I created a simple sidebar image to act like an ad, and want it only on one of my stores, not both. I edited the SupportedWidgetZones.xml file and uncommented the right_side_column_after widget zone and updated my widget to be placed in that zone. In the Stores tab, I checked the limited to stores option and chose the 1 store I wanted it to show up in. The widget correctly displays the item in the right sidebar, but it shows up on both stores. There are no other conditions set on the widget. I am only running the trial version, however. Not sure if this is a limitation to the trial or not. Thank you for reporting this issue. It had been fixed and uploaded on our site. You can download the plugin again and replace the existing plugin with the new downloaded one. Please let us know if the issue still exists! The HTML Widgets use the default text editor (tinyMCE) that comes from the nopCommerce platform. It is the one which strips the <g:plusone> tag, because this is the way it works. Looking at the tinyMCE documentation, it has an option "extended_valid_elements", which might be of help. I'm trying to have my HTML widget show on a single product on a category page but I cannot get the configuration to work properly. I have it set to show in the productbox_addinfo_before widget zone. I confirmed that it will show there so there is no issue when it comes to it displaying. I do not have any conditions other than the default state to be "FAIL" so that it does not show anywhere. I then have a product override set up to override that condition. That product override is not working. I added a product there in which I do want the widget to show but it will not show only on that product. It seems to either show on all products or show on none. "Override Product Conditions" work only if you are on the Product Page. I can suggest a workaround for this but it may slightly harm the performance since Product Conditions are not supposed to be executed outside Product Pages. We're having an issue where I am unable to add a condition. 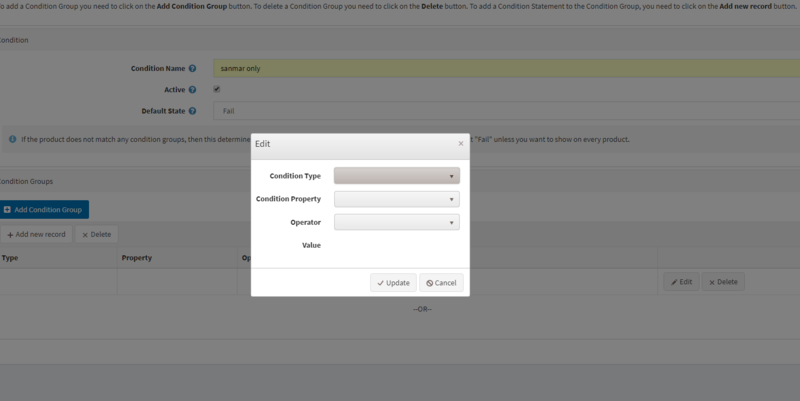 The Edit dialog pops up with the Type, Property and Operator but clicking the dropdown for Condition Type or any others do nothing. This message is all that's in the console: [Deprecation] Synchronous XMLHttpRequest on the main thread is deprecated because of its detrimental effects to the end user's experience. Please check the version of the HTML Widgets and the Core plugin from System -> System Information. If they are different update the older one to the latest version. Thank you for the response. We're on nopCommerce 4.0. Both the Core and Plugin are the same version. This was working previously on this website so something may have affected it, we're just not sure what.